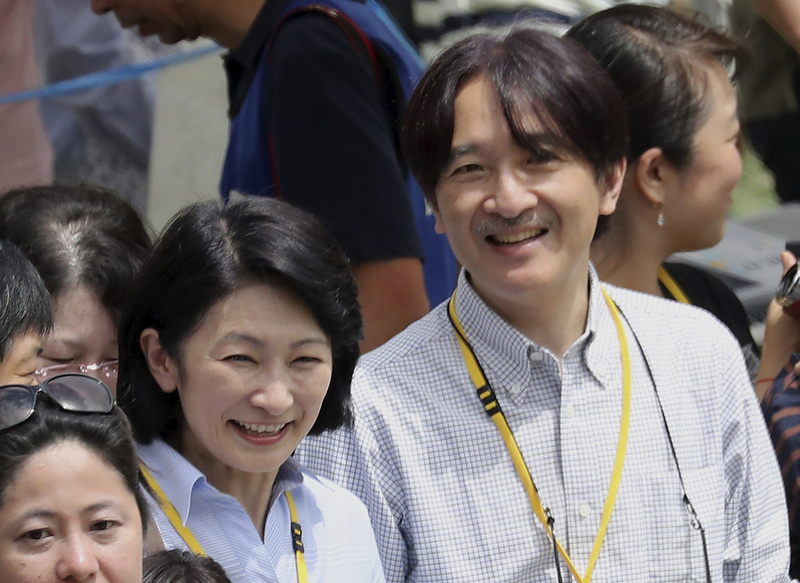 HONOLULU - Prince Akishino and his wife, Princess Kiko, arrived in Hawaii on Monday for a six-day official visit to commemorate the 150th anniversary of Japanese immigration there — part of yearlong celebrations. Prince Akishino laid a white wreath with peace lilies Monday at the National Cemetery of the Pacific in remembrance of fallen U.S. troops. The couple was accompanied by cemetery director James Horton, and Adm. Phil Davidson, who last week became the commander of U.S. Indo-Pacific Command in Hawaii, the American military’s Pacific headquarters. 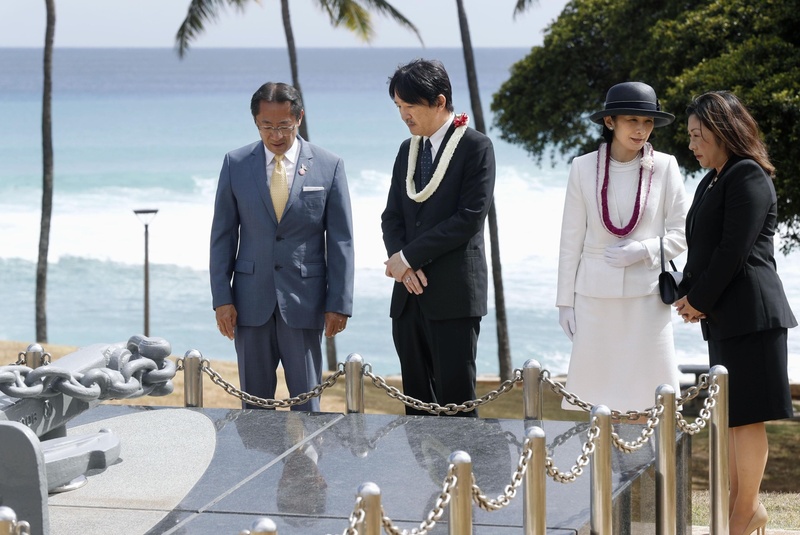 The prince also laid a second white wreath at Ehime Maru Memorial in downtown Honolulu’s Kakaako Waterfront Park, which commemorates Japanese lives lost when a U.S. Navy submarine rammed into a Japanese fisheries training ship in 2001, killing nine people, including four students. During their visit, the prince is also scheduled to deliver a speech at a ceremony Thursday marking the arrival of the first group of Japanese immigrants to Hawaii in 1868. The couple later visited the Bishop Museum and joined an opening ceremony for its special exhibition “Gannenmono: A Legacy of Eight Generations in Hawaii,” which honors the first Japanese plantation workers to Hawaii — of which there were about 150 — known as the gannenmono. 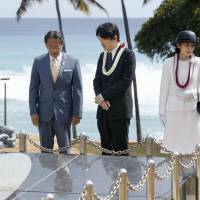 The prince and princess were welcomed by some 200 descendants of those immigrants and said “aloha” to children. The couple was surprised to learn there are at least 1,000 offspring of one of the gannenmono. 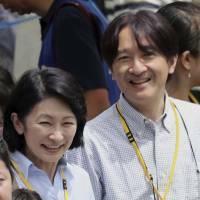 On Wednesday, the couple are set to attend an event organized by the Association of Nikkei and Japanese Abroad, a Yokohama-based organization connecting the Japanese diaspora with its ancestral homeland. The prince and princess will also plant a tree in Thomas Square and attend dinner with Gov. David Ige at his residence, Washington Place. The Hawaiian-inspired menu will feature local ingredients with Japanese touches, such as oysters from Kualoa Farm served with yuzukoshō, a Japanese condiment typically made of chilis, yuzu peel and salt. Other dishes will include pipi kaula short rib with meat from Kauai, a throwback to a spiced treat similar to beef jerky eaten by Hawaiian cowboys, and steamed moi, called “the king’s fish,” as only royalty were allowed to eat it, according to Cindy McMillan, a spokeswoman for Ige. The ogo (seaweed) relish for the fish will contain herbs from the Washington Place garden. The couple will also taste poke with locally-caught ahi tuna and feast on a dessert of miso-pecan ice cream — all dishes created by Honolulu chef Chris Kajioka of city restaurants Vintage Cave and Senia.